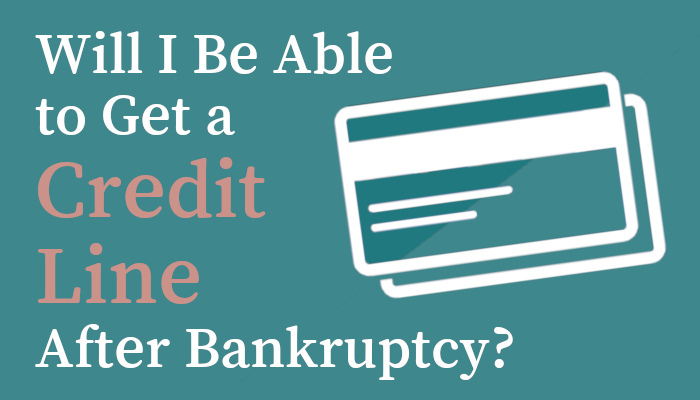 Will I Be Able to Get a Credit Line After Bankruptcy? For many wage earners, business owners, and retirees, bankruptcy can be an effective solution for getting out from under the burden of crippling debt. Bankruptcy is a way for individuals to get a fresh financial start by discharging some of their debts, or restructuring their debt obligations to make them more manageable. Doing this can allow you to get some breathing room, and move into the future on surer financial footing. But, as you look ahead to life after bankruptcy, it’s also important to remember that filing will have some lasting effects. Bankruptcy can take a toll on your credit score, and may impact your ability to buy a home or make other big ticket purchases. However, the effects of bankruptcy won’t last forever – and they’re often far more manageable than many people think. Case in point? While many people tend to believe that filing for bankruptcy will have a major impact on their ability to secure credit, the reality is that there are many options and solutions out there for individuals after bankruptcy. In many cases, bankruptcy filers will be able to quickly start rebuilding their credit responsibly – without the looming threat of burdensome debt dangling overhead. Let’s discuss some of the biggest “FAQs” on credit post-bankruptcy. Disclaimer: The Gunderson Law Firm is not offering financial advice. This post is intended exclusively for informational purposes, and does not necessarily represent the opinion of the firm or its clients. Online readers should not act or decline to act, based on content from this site, without first consulting an appropriate professional. Be sure to read our full disclaimer (link) before proceeding. If you file for bankruptcy, it will remain on your credit report for several years. Broadly speaking, a Chapter 7 bankruptcy will typically remain on your credit report for up to ten years, and a Chapter 13 bankruptcy will usually be reported for seven years. When you file for bankruptcy, you can expect your credit score to be affected. Generally, people with relatively good credit before bankruptcy may see their score drop more than those with comparatively poorer credit. Typically, individuals can start the process of improving their credit score immediately after concluding the bankruptcy process; many people find that their scores make a significant recovery more quickly than they may have anticipated. How Soon After Bankruptcy Can You Apply for Credit? As you begin to wrap up the bankruptcy process and start looking forward, you may want to start thinking about when you can begin rebuilding your credit. In fact, with many of your assets potentially liquidated during bankruptcy, starting to rebuild in a responsible way may be one of the most important things to consider, post-bankruptcy. Broadly speaking, you can generally begin to apply for credit again essentially immediately after the conclusion of your bankruptcy process – which is typically several months for Chapter 7, and several years for Chapter 13. While you may be able to apply for credit fairly quickly – and may even start receiving credit card offers in the mail – keep in mind that you may well be denied, or else face significant strings, such as exorbitant rates or extremely low credit limits. Authorized usership. In this arrangement, you are added as a designated “authorized user” on someone else’s credit card, allowing you to take advantage of their spending habits and positive payment history. Secured credit cards. A secured card allows consumers to gain access to the convenience of a credit card, while offering greater assurances and protection to the card issuer. When you get a secured card, you put down a deposit, typically several hundred dollars. This way, rather than borrowing against an unsecured line of credit, you are borrowing against your own security deposit. Credit cards with co-signers. In this arrangement, you may have a friend or family member with superior credit act as a “co-signer” on your credit line. This person is then held responsible if you fail to make payments on time. What Can Consumers Do to Get Back on Track After Bankruptcy? One key thing to remember about bankruptcy is that it’s designed to help consumers move forward, free from the burdens and hassles of debt. It’s a fresh start of sorts – but consumers generally need to take active steps to make progress and avoid severe debt issues in the future. There are many moving pieces when it comes to bankruptcy – including understanding what it may take to get started, and how you can best move on after the process has concluded. If you have any further questions or concerns about any aspect of the bankruptcy process, don’t hesitate to get in touch with the attorneys and staff of the Gunderson Law Firm to continue the conversation. Based in the heart of Chicago, our attorneys and staff have extensive experience in the area of bankruptcy law. Every day, we work to protect our clients’ assets to the highest degree possible under current laws. Drop us a line if you’d like to get in touch or set up a free initial consultation.